Doll's Musings: 300 Follower Giveaway!!!!! Finally I completed the little box I have been planning for this giveaway. I will include a couple of other little goodies to add to the giveaway. I had thought about doing something very unique for the giveaway but there has been an awful lot of stress going on in my life right now so I have to keep it simple. So I'll let Titus introduce the box and I'll explain the rest. I stitched this little box using DMC and VMT's and trimmed it with some gold brocade, left over from my Ukrainian dancing days, so it's very special brocade!! That's it. If you want to, you may advertise the giveaway on your blog, however, I'm not making it a rule. I really love this little box and hope that it will find a home where it will be equally loved! Thank you all for joining my humble blog! Enter by Sunday, June 2nd and the draw will be Monday June 3rd! Edited...forgot to put a date on it! Titus is looking gorgeous, as usual! I'd love to be included, Anne, the box looks fantastic. :D Congrats on reaching 300! This is so beautiful! I am destined to win this as there are currently 300 unread posts in my Reader so that is number coincidence and Means Something! Congratulations on your 300 minions. A lovely box and very sweet looking kitty. Please drop my name in the draw...love boxes! What a beautiful box Anne. I would love to be entered in your giveaway. Well I find what you made to be very unique -- and beautiful too! You're so sweet to have a giveaway! Thank you! I hope the stress levels go down soon. Hugs -- not fun. I would love to be entered into your giveaway. Your box is really beautiful! And since Titus approved it, you know that it has to be. He's beautiful too! I hope that the stress levels even out soon!! Gorgeous box, love it! Please enter me in your giveaway, thank you! Hope things ease out soon! Titus is outdoing himself in cuteness today : ) Please include me in the drawing. How very cool to have trimmed the box such special braid! Congratulations on reaching 300 followers! Ooo its my birthday on June 2, maybe thats a good omen. I would love to be included in the draw please, I am already a follower. Thanks for the opportunity. Very sweet box ~ and especially wonderful that Titus approves! Sorry to hear about the stress ~ hope there is some relief soon...and thanks for such a sweet giveaway! What a lovely giveaway! I would love a chance...thank you! Wow! 300 followers , that's terrific.The little box is adorable! !It would be so happy at my house! Congrats on 300 followers! Titus makes a lovely Vanna White, showing off the beautiful box! It really turned out great and I love that you added trim from a dance costume to make it even more personal and special and unique! I'd love to give it a good home! I hope whatever is stressing you, subsides soon. Stress is so bad, in do many ways. Take care of yourself! Congratulations on 300 followers! Titus is modelling the box beautifully. Hope your life gets less stressful soon . What a lovely box. I can picture it on my coffee table full of treasures. I hope your stress is over soon. You've done a fantastic job on this little box, please count me in! Congratulations on 300 followers! What a lovely little box. I would like to enter your giveaway. What a gorgeous little box! I'd love to enter your giveaway. Congrats on 300 followers. Hello Anne! I would love a chance to win this beautiful, special box made by you! The blue paint and stitches remind me of Titus' gorgeous eyes!! It's so so pretty! And it's Titus approved! Please count me in! Nice work! Really turned out lovely. Titus may not wanr to let it go! Aww so cute... sweetie kitty.. Such a pretty box ..
Hi Anne, such a pretty box - please count me in! Titus is so sweet, too. Congratulations again on reaching 300 followers. I understand fully about not being able to fit everything in, I have yet to get my Giveaway all organised, just too much going on! What a gorgeous little box! I'd love to be entered, please. Thanks for the opportunity, and I hope you de-stress soon. The box is beautiful and I would like to be entered, too. Congrats on reaching 300 followers! I'm sorry to hear things have been stressful for you lately. I hope things start going better soon! Happy 300+ followers! Your box is a great success-very cute! Please enter me in the giveaway. There is always something nice to see here on your blog. Would love to enter the draw for the gorgeous box. Titus looks like he should be spinning numbers on wheel of fortune, he has the Vanna thing down. Please put my name in the hat. I would love a chance to give this wonderful piece a home. The box is lovely and Titus one handsome guy! Add my name to the hat, I promise to love your box if I'm the lucky winner. Gorgeous box Anne! I just love the blue color and of course your stitching. I would love a change at your giveaway. Congrats on hitting 300 followers! 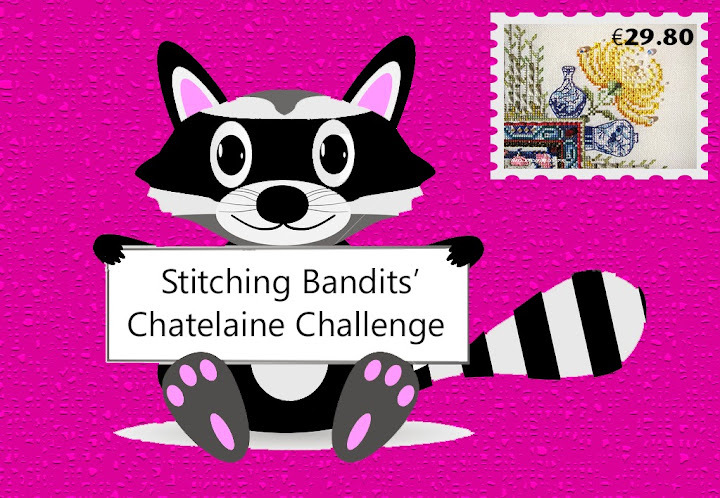 Your little stitched box is gorgeous and I would love to be entered into the giveaway! I have been a follower of yours for quite a while now. Titus is, as always, such a handsome devil! Thanks for having such a cool giveaway item! I can see why Titus gave the box his "paw of approval," Anne--it is just beautiful. I would love to throw my name in the hat :) Thanks so much! Congrats! I'd love to be entered in your giveaway! Congratulations on reaching 300. Titus is such a pretty kitty and the box looks fantastic. Please add me to your giveaway, thank you! Love seeing your cross stitch items especially since I don't x stitch much any more. Just discovered your blog and am now a follower. Love the box. I was wondering what to do with my small stitched stuff and a couple or three boxes is a great idea! Thanks! Oh, please include me in your giveaway! Cute box!! I'm sure you know I'm a follower. Count me in? Hi Anne. what a gorgeous box!! I would love to win it. Titus is quite handsome!! 300 - wonderful! And such a beautiful box!!! Whoo whoo happy dancing here with you re the job. just read your latest post -well done YOU. I would like a chance but it may be slim as I am in the UK. You have made a wonderful job of the box and Titus is such a help isnt he. I think the box matches the blue of Titus' eyes! Thank you for this lovely opportunity Anne. Congratulations on 300 followers and the box looks beautifully stitched. Such a beautiful box, I just fell in love with it, Please if I am not to late could you add my name to the hat, hugs. Congratulations on your 300 followers, Anne! The box is lovely and offsets your stitching perfectly. The braid from your dancing costume makes it all the more a special "Titus approved" treasure. Please include me in your giveaway if it's not too late! I adore the box finish that you've completed. Congrats on 300 followers!